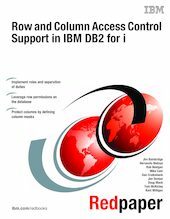 This IBM® Redpaper™ publication provides information about the IBM i 7.2 feature of IBM DB2® for i Row and Column Access Control (RCAC). It offers a broad description of the function and advantages of controlling access to data in a comprehensive and transparent way. This publication helps you understand the capabilities of RCAC and provides examples of defining, creating, and implementing the row permissions and column masks in a relational database environment. This paper is intended for database engineers, data-centric application developers, and security officers who want to design and implement RCAC as a part of their data control and governance policy. A solid background in IBM i object level security, DB2 for i relational database concepts, and SQL is assumed.